The forecast for Gold in 2019 Shri V.P. Nandakumar, MD & CEO Manappuram Finance Ltd. Introducing Senator from the house of CERA C u r a t e d b y r e n o w n e d I t a l i a n d e s i g n e r, E t t o r e G i o r d a n o . Editorial “Who, being loved, is poor?” Poet Oscar Wilde implies the ‘real’ richness of love in the line. In the month of Valentine Day, it is all over love in the air. Love and beauty are two inseparable concepts. In this edition, you can see exclusive photographs of seventeenth edition of Miss South India 2019 hosted by Ajit Ravi’s Pegasus in association with the Rotary Club of Coimbatore’ Texcity. The golden crown designed by Parakkat Jewellers was won by Keralite Nikita Thomas. 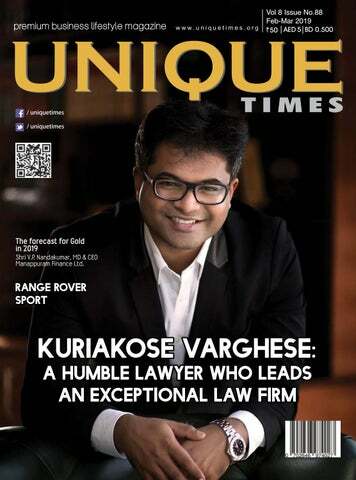 Our cover story is about Kuriakose Varghese, a humble lawyer who leads an exceptional law firm and who believes the legal profession is not only a lucrative profession, but also a dignified one. Chairman and Managing Director of Manappuram Finance, V.P. Nandakumar in his regular column forecasts the price movements of Gold in 2019. While in Auto, our experts introduce Rs.1.23 Corer Range Rover Sport, this edition ‘Travel’ unravels the rare facts of a SubSaharan African country called Gabon. Stories on beauty, stock market, gadgets, banking, success, movie, and books are there. I sincerely hope you find as much joy in the issue as it brings me. The Digital transformation moment in entrepreneurship! ndian Prime Minister Narendra Modi, whose government is going to face its crucial general election in few months, is preparing to impress the section of small businessmen which is one of the most influential business sections in the country- with the offers of cheap loans and free insurance coverage. It is this section which suffered the most during the demonetisation of the highest denomination banknotes of Rs 500 and Rs 1000 by the Modi government. It is evaluated that if the concerns of this section are not addressed properly, it will be difficult for the saffron camp to ensure the support of its rural vote base. arm loan waivers are likely to affect the fiscal health of those states which are driven by the political strategy of aggressive populism, as per a report published by a popular rating agency based in India, the India Ratings and Research. The report says that the waivers and similar measures are likely to increase the fiscal deficit of the states where it is encouraged. According to the report, the total fiscal deficit of the country will be not less than 3.2 percent in the Financial Year 2020, which is in fact at least 0.4 per cent higher than what has been forecasted recently. hina’s trade war with the United States has affected its own economy severely. The latest GDP rate of 6.6 per cent is the lowest the Communist Country has witnessed in the last 28 years. After it experienced the depressing growth rate of 3.9 percent in the year 1990, China has never ever tasted such a humiliation. The present rate is equated to the unimpressive growth rate of 1990s is because of the nature of the present decline. Like the decline happened in the year 1990, the latest is also politically motivated. Anyway, it is satisfactory that the economy of China has performed at least 0.1 percent better than what its experts have predicted it would. opular International right group Oxfam has shocked the world with its finding that the ‘richest’ have seen their fortunes swell, but the ‘poorest’ have seen their fortunes shrink in the latest fiscal. The organisation has criticised the economic structure of India severely, especially its tax collection structure. As per the Oxfam’s observation, the Indian ‘richest’ is increasing their fortunes much faster than their counterparts elsewhere. According to the Oxfam, the top one percent of the country’s rich has seen their fortunes grow by at least 39 percent in the last fiscal –which is several folds higher than the rate elsewhere. onsidering the pace by which the digital platforms of India grow and swallow the business platforms of the country, India has decided to set up as many as twenty cyber cities across the country. The crucial information has been publicised by a senior official working in the Department of Science and Technology, when he has attended the pan IIT Conclave 2019 organised at IIT campus in New Delhi. As per what little he has informed the audience about the plan, each cyber city would have a distinct focus. He has said that a huge sum of 3,660 crores has already earmarked for the ambitious project. he Tirumala Milk Products Private Limited, the dairy company completely owned by French dairy conglomerate Lactalis, has acquired the Mumbai-based dairy Prabhat, which has an aggregate milk processing capacity of 1.5 million litres per day and annual revenue of Rs 1,554 crore. One of the world’s top dairy conglomerates has invested as high as Rs 1,700 crore to own the growing dairy firm based in the commercial city of India. The management of the Mumbai-based firm has opined that the acquisition would strength the company and would help it to become one of the most powerful dairy conglomerates in the country. Accordingly, we expect the year 2019 to be positive for gold as further dollar appreciation is less likely with slowdown in the US economy and expected pause in interest rate hikes by the US Fed. To put a number to our expectations, we would expect gold price in 2019 to stay within a price band of US $1,210 to US $1350 per ounce with an average price of around US $1,280. s we enter the new year, it is time to take a look at how gold has performed as an investment class and how it is likely to behave in the coming year. One of the reasons why we keep an eye on gold is that unlike other commodities whose prices depend on simple demand and supply, the price of gold has many more variables to it. The state of the world economy and the interplay of political and economic forces have a major role in determining gold price and its direction. Therefore, any meaningful analysis must take into account all these wider issues and it is precisely this aspect which makes the exercise difficult but enlightening and worthwhile. low of USD $1,178 before closing the year at US $1,279, to register a fall of 0.93 percent over the year. The international price of gold experienced a steady and continuous upward trend from US $271.04 per troy ounce in 2001 to its all-time high price of around USD $1,900 per troy ounce September 2011. Thereafter, gold price remained range bound for some months and subsequently started declining steadily from 2013 to reach USD $1,060 by the end of calendar year 2015. Here is a tabular summary of gold price movements in the international markets over the last five years. The below graph depicts international gold price (US$ / troy ounce) for the year 2018.
year, the fall in gold price during the year can be attributed mainly to strengthening of the US dollar amid the Sino-US trade conflicts and the US Fed hiking interest rates. Uncertainty in any form benefits gold in its role as a hedging instrument and safe haven. In predicting the future price of gold, analysts are, as usual, a divided lot. Some of the prominent forecasts for 2019 made towards the end of 2018 or the beginning of 2019 are given below: 1. Goldman Sachs: If U.S. growth slows down next year, as expected, gold would benefit from higher demand for defensive assets. Goldman Sachs predicts gold price for 2019 targeted at around USD $1,325/Oz. The youth of today think differently from the generations before. Social media and exponentially efficient connectivity, aligns their views to the global youth. They are restless, keen to take risks and also rewrite their own careers as often as they deem fit. They are independent in their thinking and do not always have the pressure from parents to follow the trodden path. egal profession is not only a rewarding profession, but also a dignified one. This edition, discusses one of the more successful and talented advocates in the country, Mr Kuriakose Varghese. An alumnus of University of London and Delhi University, Mr. Varghese is the Managing Partner of the leading law Firm KMNP Law. There are many things that one should learn from this dedicated lawyer. Let’s hear what he has to say about his career, his college days, his Firm and many more. What motivated you to enter the challenging profession of law? ernment Standing Counsel in the Delhi High Court. In my view, law is an excellent profession. Occasionally, it also gives an excellent spiritual satisfaction. There is a divergence between the general perception of law and reality. any of the liberal arts subjects that prompted me to look for that opportunity in the national capital itself –at that time, not many liberal arts colleges were available in Kerala. St. Stephen’s College was the best option available. It was not that difficult for me to get an admission in the collage, as I was a school topper. I was selected by an interview board comprising of Dr. Anil Wilson, Prof.
Tanika Sarkar and Prof. Wanchoo. There were adequate opportunities for all-round development in the college –from photography to social service, apart from academics. In my third year in the college, I was elected as the Student’s Union president –a position held by Dr. Shashi Tharoor in his days at Stephen’s. It was an incredible journey. The campus gifted me many close friends and excellent teachers –Prof. Baker and Prof. Upinder Singh (the daughter of former Prime Minister Manmohan Singh) were my teachers. Say few words about your firm. How difficult it is to run a law firm? Liberalization has brought in several changes in our economy and society. It has boosted the economy. That is one side of the story. The other side is that it has increased the disparity between the rich and poor. very large international hotel chains, one of the world’s wealthiest temples, a Bretton Woods Organization and one of India’s largest spiritual organizations with followers across the world. KMNP Law has worked on the Coal De-Allocation Scam case, Call drop case, GM Crops, Tiger Conservation and many others in the Hon’ble Supreme Court of India. Being a legal partner of a firm is a challenging job. My aim is to bring stronger intellectual growth to the organization. Is ASEAN becoming a strong union? ASEAN conference held in Bangkok. I don’t think all possibilities of that multilateral organisation have been thoroughly explored yet. Nowadays, bilateral agreements get more acceptance than the multilateral ones. Our trade with Singapore –an ASEAN country- boomed not because of any multilateral agreement, but because of the Comprehensive Economic Partnership Agreement reached between India and that country. How far India should go with the policies of liberalization? Liberalization has brought in several changes in our economy and society. It has boosted the economy. That is one side of the story. The other side is that it has increased the disparity between the rich and poor. Many people have been forced out of their land and traditional jobs due to the policies of liberalization. What do you want to say to law career aspirants? an excellent spiritual satisfaction. There is a divergence between the general perception of law and reality. The contribution of a good law teacher, to the making of a good lawyer is remarkable. Dedication and hard work is paramount. Be supportive to the emotions of the potential consumer. The purchasers need your encouragement. But yet, you must appear as honest and people with integrity. The electronic commerce are beginning to fill this space of authenticity and care for the buyer. The product and its messaging must occupy the mental moments of your buyers. Adv Sherry Samuel Oommen is a practising lawyer at High Court of Kerala who specialises in tax and Corporate Laws. Presently he heads the tax and corporate law practice of Nash Capital Partners. Apart from being a qualified lawyer, he is also a chartered accountant, cost accountant and a company secretary. He is currently pursuing his Doctorate Degree and is reachable at sherryoommen@nashcp.com. GST law has witnessed key amendments and proposals pursuant to the recent meetings of GST Council. These amendments and proposals are major takeaways towards accomplishment of the avowed objective of One Nation One Tax One Market. This Article gives an insight to the recent changes and proposals in GST regime from the period of December 2018 till date which are the outcome of 31st and 32nd GST Council Meetings. While the GST Council in its 31st meeting worked towards removal of the difficulties faced by taxpayers in coping up with compliances on introduction of new tax regime; the 32nd meeting focussed on assuaging the concerns of MSMEs and SMEs from the compliances of GST and opening up a platform for them, ensuring ease of doing business. This Article gives an insight to the recent changes and proposals in GST regime from the period of December 2018 till date which are the outcome of 31st and 32nd GST Council Meetings. The changes proposed in the 32nd meeting of the GST Council are indeed welcome. The concessions provided would largely come into effect from 01 February 2019, which would, indeed, benefit small dealers/service providers. the residential segment faces under the new indirect tax regime. •Suggesting a scheme for the sector like the composition scheme where taxpayers can pay a flat GST rate without the option of availing credit on inputs for traders. •Examining GST on transfer of development rights and development rights in a joint development agreement. •Examining legality of inclusion or land in composition scheme and suggest valuation mechanism. The question of uniform taxation for lotteries also invited diverse opinions. Currently, a state-organised lottery attracts 12 per cent GST while a state-authorised lottery attracts 28 percent tax. The disparity in tax structure is critically refuted and questioned by the private players and the Council has therefore constituted a Panel of Group of Ministers to look into the same. Dolly Neena Dolly Neena is founder of Your Wing, a training company born out of a noble cause and spirit. She holds a decade long experience being a passionate mentor and entrepreneur. As deaf as the man who cannot listen! Method In a bowl, whisk together the sugar, cornstarch and salt until well combined. Set it aside. In a small saucepan over medium heat, combine the coconut milk, cocoa powder and chocolate chips, and cook until the chips have melted into the milk beverage. Once the chips have melted, pour in the dry ingredients and continue whisking until the pudding begins to boil. Turn the heat down to low, and stir until the pudding thickens and coats the back of a spoon. Remove from the heat, stir in the vanilla, and pour the pudding into individual serving cups. Serve warm or chilled. Break choco bars into four sections, for a total of eight pieces. Set it aside. Blend butter with brown rice syrup. Mixture should pull away from the bowl and form a ball. Set it aside. Place one level teaspoon of butter mixture on the top of one section of choco bar. Flatten and form butter mixture to cover the choco bar piece. Cover a tray or plate with wax paper and place finished candies on top. Continue with remaining choco bar pieces. Place 2 tablespoons of chocolate chips in a small plastic sealable bag. Place bag in microwave leaving the top unsealed. Heat in short intervals gently pressing the softened chocolate to make sure the chocolate melts evenly. When chocolate is almost melted, remove bag and press out any remaining lumps. Remove any air from the bag and seal bag. With a scissors, snip a very tiny hole in one corner of the bag. Beginning on the wax paper, drizzle the melted chocolate back and forth over the candies. Allow chocolate to harden about 20 minutes. Preheat oven to 180 Celsius. Prepare a cookie sheet with parchment paper. In a large bowl, add coconut butter and coconut sugar. Mix well until blended. Add brown rice flour, white rice flour, vanilla and coconut milk. Stir until a wet dough forms. Moisten your hands with warm water. Shape into rounds. Flatten with warm, moist hands. Shape about 2 inches in diameter. Bake for 15 minutes. In a medium bowl, add the icing sugar and beet powder. Whisk until blended. Add the coconut butter, salt and Coconut Milk. Whisk well until it becomes light and fluffy. Place in Icing in a piping bag with a regular tip. Make hearts on each cookie. air fall is a serious problem that hunts most beauty conscious ones. All age groups are equally vulnerable to this condition. Though it is difficult to find a permanent solution to this issue, there are many simple ways available to reduce the impact of this condition. To effectively control this, it is important to accept that hair fall is a natural process. It is not necessary to use heavy chemicals to fight hair fall. It is pertinent to be aware that the use of heavy chemicals may lead to other serious health issues. Experts recommend the use of natural remedies over chemicals to deal with the issue. In this edition, some simple natural tips are presented to help fight the worrisome heath condition of hair fall. times in a week. 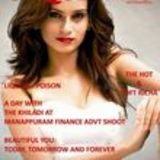 Hair conditioners which are made up of this product are widely available in the market. It is the widely used natural product for healthy hair. Keralities are very fond of this oil. They use this oil for almost anything and everything. It is not that fondness that encourages them to use the oil on their hair. There are several studies available to support the argument that Coconut oil is capable to reduce hair fall. Apply Coconut oil every day. It can either be used minutes before the hair is washed or minutes after the washed hair is completely dried. The regular conception of fish considerably reduces the issue of hair fall. Fish contains an amazing component called Omega fatty acid, which is very useful for the overall health of hair. For healthy hair, include fish in daily diet. Many experts say that onion is a very effective natural medicine to reduce the threat of hair fall. It is not clear how it works, but it is clear that it somehow fights the condition. Apply Onion juice at least once in a week. It is advised to apply it directly on the scalp of head for better result. The problem with this method is that many find it difficult to tolerate the smell of onion. hat comes first to your mind when you think about Africa? Naturally, poverty, civil wars, ethnic conflicts and diseases come first. If this is the way you think, you know nothing about this beautiful continent. In reality, Africa is not that bad. It is one of the most gifted regions in the world. Its climate, natural beauty, animals, birds, culture, cuisines, architecture, art and even its human beings are special. If you want to enjoy its true beauty, you need to open your heart, along with your eyes. Once it is seen with your heart, all of your misconceptions about this land slowly vanish. Our journey through Africa has brought us to Gabon this week. Not many have heard about this land prior to this introduction. Libreville, Lambarene, Franceville, Port Gentil and Lope-Okanda Reserve are the prime attractions of this country. It is important to note here that the country’s tourism infrastructure is not that developed at this moment. That limitation is what that prevents the entrance of many potential tourist destinations into this list of attractions. Gabon is not only famous for its captivating destinations, but also for its art, culture, architecture and cuisine. 1.Slice boneless chicken into thin sheets then cut into strips. 2.Marinate chicken with 1/2 egg, 1tsp soya sauce, 1/4 tsp pepper powder, 1pinch sugar & salt keep aside for half an hour. 3. Spread cornflour in a plate, roll chicken stripes over the cornflour until the chicken stripes are coated well. 4.Heat oil in a frying pan. Fry chicken pieces. 5.In a small bowl, add chilli powder, garlic powder and vinegar. Add water and make into a paste. 6.Heat 2tbsp oil in a pan, add ginger garlic and green chilli. Saute well. Add chilli paste and stir well. Add all the remaining ingredients and boil. Add chicken and toss well. 1. Preheat oven to 180 degree 2. Mix maida, cornflakes Powder & sugar powder well. 3. Add vanaspati & vanilla essence and knead well. 4. Add crushed cornflakes & cashews. Mix well. 5. Roll teaspoonful of dough. Place cookies 2" apart on parchament lined baking sheet. Bake@180degree. Vivek Venugopal is one of India’s top automotive writers with over a decade’s experience in road-testing and reviewing cars. He is currently the Editor of Quarter Mile magazine and a columnist in several leading magazines and newspapers. He is also a highly sought after consulting engineer and market analyst for many automobile manufacturers. At Rs.1.23 crores, this updated Range Rover Sport sits in a crowd of very capable SUVs from the Land Rover brand -all in the same price range. For the style conscious people, there is the Velar, which is more road-based and sportier, and, then, there is the larger more versatile and rugged Discovery for the outdoorsy ones. t is a musical film directed by highly talented filmmaker Zoya Akhtar. The songs of the movie are the contribution of musical trio ShankarEhsaan-Loy (Shankar Mahadevan, Ehsaan Noorani and Loy Mendonsa). The movie tells the story of a boy born and brought up in a ghetto in Mumbai. The movie shows how he beats all constraints that obstruct him from embracing his dream of becoming a rapper. The movie clearly portrays the socio-economic structure of the present day Mumbai. The movie also tells a romantic story, along with the main storyline. Ranveer Singh, Alia Bhatt, Kalki Koechlin, Vijay Raaz and Amruta Subhash appear in the lead roles. t is an action thriller directed by acclaimed filmmaker Abhishek Chaubey. No any movie in the near history that has covered the life of dreaded Chambal valley as good as how this movie has portrayed the valley. Sushant Singh Rajput, Bhumi Pednekar, Ashutosh Rana, Manoj Bajpal and Ranvir Shorey appear in the lead roles. There are several mind blowing action sequences in the movie. The movie is produced by Ronnie Screwvala. Almost all lead actors have done their part exceptionally good. Mr Sushant Singh and Ms Bhumi Pednekar deserve special mention. So far, all reviews about the movie have been positive in nature. t is an action thriller directed by popular Norwegian filmmaker Hans Petter Moland. The film tells how an ordinary snow plough driver transforms himself into a dreaded vigilante to avenge his son’s murder. There are several exceptional action sequences in the film. The film is based on ‘In Order of Disappearance’ created by Kim Fupz Aakeson. Liam Neeson, Emmy Rossum, Tom Bateman, Julie Jones and Laura Dern appear in the lead roles. The film has received mixed reviews. The presence of Liam Neeson is what that makes this movie more attractable. The film is distributed by Summit Entertainment. Its music director is George Howe. t is a fantasy thriller directed by American filmmaker Robert Rodriguez. This science fiction movie discusses not the story of this generation, but the story of a future generation. For that reason, there are several indigestible elements in the movie. The central character of the movie is Alita. She is a mysterious character. It is through her eyes that the viewers see the world. Like the viewers, the character is also alien to that world. Why her past is hidden is the central question which is answered as the movie progresses. Rosa Salazar, Christoph Waltz, Ed Skrein, Jennifer Connelly, and Mahershala Ali appear in the lead roles. he credibility of the electoral system of India has been questioned by a hacker recently. No sensible citizen may have believed the claims made by the hacker. Still, it exposes how little Indians know about their electoral system. It is important to learn about this system, because it is an integral part of the democratic system of the country. Coincidentally, this book, going to reach book stalls in few days, seeks to help gain a deep insight about the subject of the Indian electoral system. It is a set of quality observations made by noted intellectuals on the subject. India at present is just a few months away from its seventeenth Lok Sabha election or General Election. It is the most suitable time to explore this subject. n contrary to the most popular belief of the bygone days that technology would liberate human beings, it has enslaved us. Already, many of us have even sacrificed our privacy, apart from many other precious things, on the altar of technology. In the modern world, technical experts steel our behavioural patter including our likes, dislikes and personal thoughts, and sell it to those who offer the highest amount for that information. In most occasions, that information reaches on the hand of those with the intention to misuse it or gain profit from it. In this book, it is clearly discussed how technology influences our social, political and economic interactions. t is the story of a rich kid who struggles to establish his own identity. The tool he uses for that task is start-up. Apart from the general problems all start-ups usually face, his start-up faces another serious problem; that problem is expectation. His family background hunts him. How he defeats all these is what the story tells. Most middle class youngsters can relate the story of the book to their life. It is its closeness to the middle class youngsters of the country that makes it attractable to that section of the society. The writer intertwines the lead narrative with the stories of Hindu mythology, to make it more interesting, and to expand its readership circle. ince independence, the Indian economy has witnessed several ups and downs. These ups and downs are the natural outcomes of choices. To learn the complicated subject of Indian economy deeply, it is important to understand who made these choices, on what circumstances those choices were made, and why those were made. The book contains all those are necessary to answer the aforesaid questions. What makes this book different from other similar books is the fact that it goes far beyond the limitations of statistics. Unlike most others that discuss the subject, it addresses directly the crux of the subject. It is why it stands above all.